>Getting a cab can be a nightmare in Seoul on a Friday. They have planned routes and mine didn’t seem to be theirs. But then I met Mr. Bang, for that was his name. I heard a Korean guy shout Itaewan and slump into a cab. Being my neck of the woods and bitingly cold, I decided to try my luck and offer a share. He accepted drunkenly. So the journey began. He introduced himself no less than three times, gave me his card twice, kissed my hand twice and the taxi driver once and asked my name four times while berating Korean taxi drivers. He turned out to be the President of a fashion company who has stores in Korea and Japan. When we reached his apartment block, for he owned the entire building, he thoughtfully put his hand on my knee and asked if I wanted to stay. But being Korean (and u have to have been here to really know this) he didn’t mean abit of “who’s your daddy?” but most likely meant for a drink. I declined and continued on in the cab and found when it was time to pay that Mr. Bang had pay for it all. The next day Christine and I wandered Seoul, looking for items she professed a house needed. I disagreed, stating I’d got on perfectly well without them and considered them unnecessary but in the end, we got a kettle, bed sheets, hot plate and food. Women eh? We found the items in a small electronic shop near the house after a fruitless but enjoyable wander around town. The shop was full of gadgets, transistors and other stuff I don’t understand with barely enough floor space to stand on. A bit like Jamesy’s room at university. This tiny guy, for he had to be tiny, had his whole world around him; his childhood obsession had been realized. His vocation reached. He made me a new cable for my shaver by soldering two together and while I usually have no interest in such affairs, I was fascinating stuff to see the little man do this. All for one pound fifty. >Saw Art the other afternoon. A play by Yasmina Reza, French woman, much-heralded across the Channel and after this rightly so. The production itself was good and the writing could be less explanatory but it’s the subject matter that appealed to me. Three middle-aged men, friends for years, falling out over a painting, a white painting albeit with white stripes across it. The men re-examine their relationship, amid the bickering and insults, to question why men are friends at all, especially when money and Alpha Male syndromes get involved. The three protagonists, a highly-strung writer, a successful dermatologist and a middle-aged joker on the verge of marriage, all with laden but shallow lives, friends without a thought. For that’s the way men are, until they aren’t. As in male-female relationships, men are content to bumble along, pre-occupied, oblivious to the billboards that women, with their subtle, wily charms construct. Keeping their annoyances inside, (for its not worth it right? ), releasing a torrent at an unprescribed moment, the long festered frustrations on their wives or maybe, just maybe, correctly on their friends. Moodily ignoring them, snapping, cutting them off, ignoring, leaving them hanging, confused. For we ignore each other’s billboards too, each other’s irritated shoulders. Water off a duck’s back etc. >Nursing a tired hangover. Planned my quiet weekend, then Paul called me on Friday. He’d just finished work. I’d finished off my list with a quick haircut. Using large scissors, I sheared my crop, leaving the mongrel look, shorter in other areas. Looks cool me thinks. In Korea though, they just look at you. It’s not black for starters, not short on the sides, moosed up to the side on the top. Who cares? So I headed out, drank with Paul until I fall asleep at 4am, got back, helped to bed by Christine. Up at 4pm, I dashed out not to be late for Andy. 30 minutes late ain’t too bad for this guy. Drank with him and Ja Min, then met Jeff at 12am and got home at 8am Sunday morning. Slept until 4pm, watched the wrestling, got a curry, slept badly and got up for work at 5am, still looking like a mongrel. And that was my life last weekend. Back studying today. Taking it slow. Off to the gym. Still look like a mongrel. In the Oxford dictionary, our friend Yoon comes under “great guy.” Not only is he intelligent, interesting, thoughtful and funky, he goes out of his way for people. He’s a sort of celebrity here in Seoul, with a blog read by over 2000 people a day. His profession is marketing in the fashion and product industry and I feel he knows a lot of people. Over the last 7 months or so, we’ve become good friends, had lunches and many drinks. We’ve met his fiancée Sera, a lovely woman (I didn’t say those words a few years but I’m getting older you know). 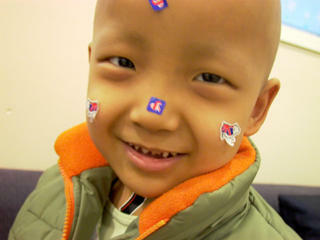 But last week, Yoon invited us to the children’s cancer hospital to meet a kid called Ga-Won. The boy is only 6 but has a cancer that develops and moves through his muscles, eventually subsuming him. The prognosis isn’t good for him and he has spent over a year in hospital in his little life, enduring chemo. Yoon raised half his yearly medical costs with a concert and auction. We arrived late as usual and met Ga-won who despite his shyness at meeting his first foreigners, played happily, asking curious questions. He didn’t know England existed, believing English was from America. I guess it will be one day for many people in the East. Sadly as they say in Korea, time was like an arrow and we had to leave only an hour later. >There is an idea that Koreans can drink. It’s only slightly true. They like drinking but they can’t really drink. They drink like teenagers, drinking games, neck your drinks and plastered by 10. I can honestly say I’ve never been close to being outdrunk. Of course Japan couldn’t go bankrupt. , With its vast savings could afford to hang in there, waiting and still waiting. Korea continued its tiger economy throughout the 1990s and its mentality it has yet to escape from. This year the economy grew at 4.7%, but that’s not good enough for the papers, who continue to pillar the government. But similar to J, the Korea economy crashed in 1998 under mountains of undeclared debts and free credit. After all, if you’re never asked to pay it back, why bother? The subsequent confidence crisis led to belt-tightening and foreign take-overs.